Note – This article addresses gate striping requirements for gates that fall under MUTCD requirements. These would be gates that open onto a DOT regulated road. 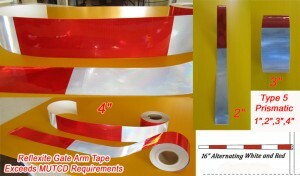 Reflective Gate Arm Tape can now be purchased in 1″,2″,3″ and 4″ rolls at www.safety-tapes.com . Section 2B.68 of the 2009 Manual of Uniform Traffic Control Devices (MUTCD) specifies how gate arms are to be marked. MUTCD regulations also apply to private property when that property connects to a DOT road. This regulation covers all gate arms including those used at railroad crossings. All gates are required to be marked with alternating red and white 16″ sections of reflective tape. The width will depend on the width of the arm. It is recommended that a Type 2 or better retro-reflective tape be used. For more information on minimum reflectivity levels see our article on that subject to the right. 01 – Gates described in this section used for weather or other emergency conditions are typically permanently installed to enable the gate to be immediately deployed as needed to prohibit the entry of traffic to the highway segment(s). the gate arm is placed in a horizontal position perpendicular to traffic. Another type of gate consists of a segment of fence (usually on rollers) that swings open and closed, or that is retracted to open and then extended to close. 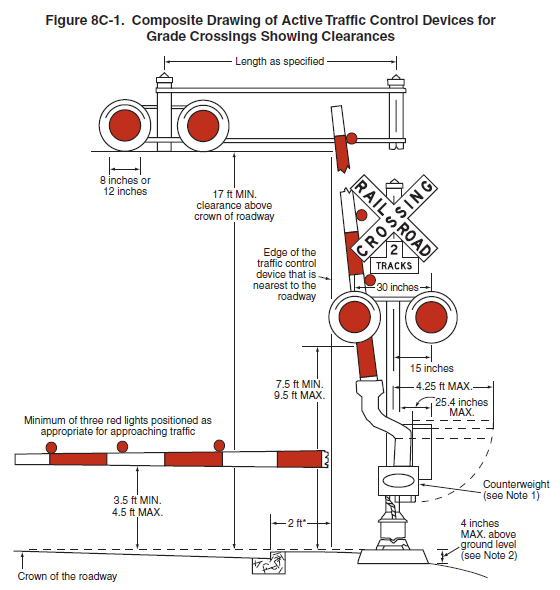 G. Grade crossings (see Part 8). C. Closing roadways for weather events such as snow, ice, or flooding, or for other emergencies. 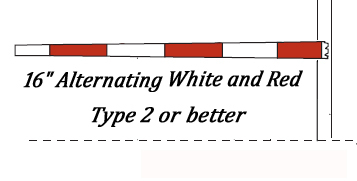 05 – Except as provided in Paragraph 6, gate arms, if used, shall be fully retroreflectorized on both sides, have vertical stripes alternately red and white at 16-inch intervals measured horizontally as shown in Figure 8C-1. 06 – If used on a one-way roadway or ramp, the retroreflectorization may be omitted on the side of the gate facing away from approaching traffic. the gate arm on which traffic is to pass. 08 – The gate arm shall extend across the approaching lane or lanes of traffic to effectively block motor vehicle and/or pedestrian travel as appropriate. 09 – When gate arms are in the vertical position or rotated to an open position, the closest part of the gate arm and support shall have a lateral offset of at least 2 feet from the face of the curb or the edge of the traveled way. 10 – When gate arms that are located in the median or on an island are in the horizontal position or rotated to a closed position, the closest part of the counterweight or its supports shall h ave a lateral offset of at least 2 feet from the face of the curb or the edge of the traveled way of the open roadway on the opposite side of the median or island. 11 – When a gate that is rotated in a horizontal plane is in the position where it is parallel to traffic (indicating that the roadway is open), the outer end of the gate arm should be rotated to the downstream direction (from the perspective of traffic in the lane adjacent to the gate support) to prevent spearing if the gate is struck by an errant vehicle. 12 – If a pedestrian route is present and if it is not intended that pedestrian traffic be controlled by the gate, a minimum of 2 feet of lateral offset from supports, posts, counterweights, and gate mechanisms should be provided when the gate arm is in the open position and when the gate arm is in the closed position such that pedestrian travel is not impeded. 13 – Red lights may be attached to traffic gates. 14 – If red lights are attached to a traffic gate, the red lights shall be steadily illuminated or flashed only during the period when the gate is in the horizontal or closed position and when the gate is in the process of being opened or closed. 15 – Except as provided in Paragraph 16, rolling sections of fence, if used, shall include either a horizontal strip of retroreflectorized sheeting on both sides of the fence with vertical stripes alternately red and white at 16-inch intervals measured horizontally to simulate the appearance of a gate arm in the horizontal position, or one or more Type 4 object markers (see Section 2C.66), or both. If a horizontal strip of retroreflectorized sheeting is used, the bottom of the sheeting shall be located 3.5 to 4.5 feet above the roadway surface. 16 If used on a one-way roadway or ramp, the retroreflectorization may be omitted on the side of the fence facing away from approaching traffic.